The wait for more Tangled episodes ends tomorrow. During the interim, Disney rewarded us for our patience with something unexpected. Rapunzel and the Lost Lagoon by Leila Howland bridges the gap between the Tangled movie and the Tangled: Before Ever After special from the television series. The book was a pleasure to read because it was written in a way that anyone could enjoy, as long as they are at least at a middle school reading level. 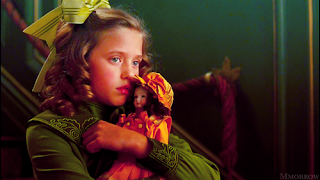 It is written in first person and switches between the perspectives of Rapunzel and Cassandra. I read the ebook version and found it very informative and enjoyable. I highly recommend it if you want to know more of the backstory behind the series. I've mentioned Rachel Bloom in my "Princess Parodies" and "Princess Rap Battles" post. 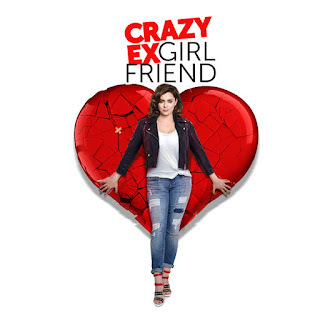 Did you know that her CW comedy/drama series, Crazy Ex-Girlfriend, has quite a bit of princess inspiration behind it? It might seem unlikely, but it's true. Rachel has said in an interview “Our generation grew up in a particular unironic time of... Disney princess movies that were smart, but still a man is the solution. You know, I’m interested to see how Frozen will shape like little girls growing up because, for us it’s Beauty and the Beast, it’s Aladdin and Jasmine, it’s Ariel and Prince Eric." Sounds like a nod to "The Rise and Fall of the Animated Prince," doesn't it? The official season 7 posters for ABC's Once Upon a Time were dropped recently, and I would like to share some of my initial reactions with you. Granted, these reactions are sure to change when I see the season premiere next week, but I'll work with what I have for now. To be honest, the season is not shaping out very well so far with its alternate realities and its identity crisis after half the cast left at the end of the last season. 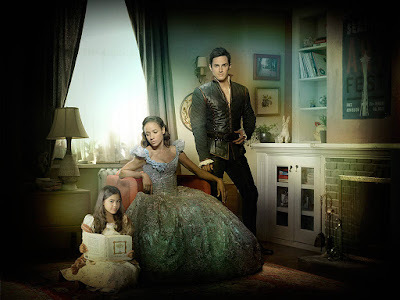 Initially, Once Upon a Time was a refreshing new take on princess offspring, with the daughter of Snow White growing up in the real world and not believing in fairy tales. It would have been a decent show if ABC's parent company, Disney, didn't get greedy by renewing the show for far more seasons than it needed in an attempt to subtly market their products. Every fandom will inevitably have an endless amount of fan-made creations all over the internet. The Disney Princesses, in particular, seem to be an obsession among artists. They have been "re-imagined" in countless different styles, timelines, and alternate realities. In fact, the trend got so out of hand that roughly two years ago, a website called LuckyPeach posted pictures of Disney Princesses reimagined as hot dogs as a joke. The post went viral. It was everywhere. People just can't get enough of Disney Princess reimaginings no matter what form they take on. One of the most famous princess fan artists is Amy Mebberson, who is known for her ongoing comic series, Pocket Princesses. Can you believe this is my 50th post? 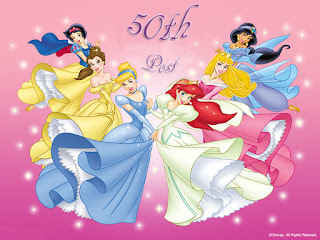 It's been an uphill climb to bring you new and exciting princess topics every day thus far. Thank you to all of my readers for your support. As much as I would love to get to 100 posts as soon as possible, I'm afraid I might not be able to keep coming up with new topics every day. Keep your suggestions coming, and I will try my best. I changed the comments settings recently, so if you were having trouble posting comments before, please try again because I'd love to hear from you. Before I get started, I'd like to point out that today marks the 30th anniversary of the 1987 cult classic The Princess Bride. Though this movie holds little significance in my life, it is a live-action princess movie that made a huge impact for many other people Read on to learn about the impact that princesses have had on my life. Japanese company Kuraudia Co. recently partnered with Disney to create a new line of gorgeous Disney Princess wedding dresses. This is far from the only company that makes wedding gowns inspired by our favorite animated heroines. 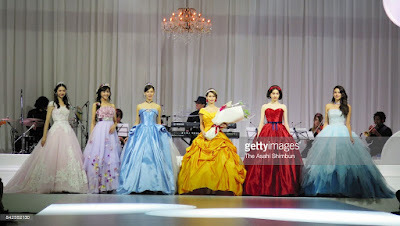 Though they recently went out of business, the popular American bridal chain, Alfred Angelo, had recently revealed several new designs for Disney Princess inspired dresses that were more modern-looking than the ones from Japan. Designer Kirstie Kelly also unveiled a Disney Princess inspired collection several years ago, which has since been discontinued. Though the Americanized versions of these dresses hardly resemble classic princess fashion, the correlation between weddings and princesses seems to date back an eternity. Do the two concepts go hand-in-hand like a bride and groom at the altar? Let's find out. Earlier this week, the newest Barbie movie was released on Netflix. Though Barbie Dolphin Magic is not technically a princess movie, it does have a mermaid in it and stars the Barbie, the part-time princess. It looks like Rainmaker is breaking their tradition of releasing the Barbie movies on DVD and switching to streaming media, which makes sense because DVD sales have dropped significantly in recent years. As a Netflix special, the movie has the shortest run time yet for Barbie, clocking in at only a little over an hour. So, is it worth watching? Here's what I think. The fall of the Disney Prince left a gaping hole in many princesses' hearts that could only be filled by a different type of love. Instead of focusing on ladies-in-waiting and stories about friendship like in the Barbie movies, Disney decided to start giving their princesses siblings. Until recently, most of them were only children, and very few of them had two parents. I've written a little about Ariel's sisters in the past, but they come off as a separate entity from Ariel with the exception of a few episodes of the series. Modern princess sisters spend just as much time together as they do apart and compliment each other's differences, teaching children how to get along with people who don't share the same perspectives as them. 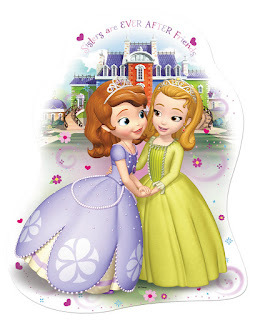 The first Disney characters to achieve this were not Anna and Elsa, but Sofia and Amber from Sofia the First.